Synopsis : The upcoming M Town film Boyz 2 happens to be a sequel of the said franchise. The film is releasing next month on 5th October 2018, while it has an interesting star cast, which include Sumant Shinde, Parth Bhalerao, Pratik Lad, Girish Kulkarni, Onkar Bhojane, and Soham Kalokhe in the lead roles. The others in the supporting roles include Sayli Patil, Shubhangi Tambale, Akshata Padgaonkar, Yatin Karyekar, Amitriyaan Patil, Pallavi Patil, Rohit Chavan, Jaywant Wadkar, Sharvari Jamenis, Ajit Shidhaye, Ritika Shrotri, and Kishori Ambiye. 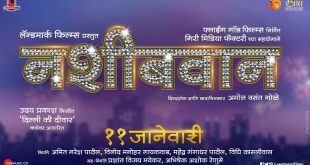 The film is directed by Vishal Sakharam Devrukhkar, while it is produced by Lalasaheb Shinde, Rajendra Shinde and Sanjay Chhabria, while the production companies include Eros International, Everest Entertainment and A Supreme Motion Pictures Pvt Ltd.
Now, talking about the Story and Screenplay of the film it is carried out by Hrishikesh Koli and the music is composed by Avadhoot Gupte and it is presented by Avadhoot Gupte. As we dig in more about the film, we realise that it happens to be the comedy genre movie, which is all set to hit soon next month. The makers have released the posters and teaser as well, which talk a lot about the movie and gives the idea of the same. It would be a perfect entertainer for the family and one can catch it with all your loved ones in the coming times. Stay tuned to know more about this film and others till we bring more on the M Town. And do comment about the same and let us know what did you like about the movie. Next ‘हृदयात समथिंग समथिंग’ सिनेमाच्या कलाकारांनी गायलेले ‘चंद्रमुखी’ गाणे झाले लाँच !